Via their avatars, children and teens gather for worship in the sanctuary of The Robloxian Christians. Founded and pastored by a Tacoma teenager, The Robloxian Christians is a real -- albeit virtual -- church where young people gather to worship, pray and connect. And it has important lessons for those who lead traditional churches and church-related institutions. Like many teenagers, Daniel Herron, 16, of Tacoma, Washington, has a busy life. He’s a member of the Sea Scouts, the nautical branch of the Boy Scouts of America. He serves on the Greater Tacoma Community Foundation’s Youth Philanthropy Board, helping to award thousands of dollars to local organizations. He’s active in his high school’s Bible study group. And he’s also the founder and pastor of an online church that has attracted more than 4,500 members. Not a “pretend” or “make-believe” church, but a real -- albeit virtual -- church where teenagers from across the country and around the world gather to worship, pray and connect with one another. At a Good Friday service, Pastor Daniel says "God is good," and worshippers reply, "All the time." Known as The Robloxian Christians, or TRC, this nontraditional congregation has important lessons for those who lead traditional churches and church institutions, theologians and youth ministers say. Not the least of which is simply the fact that a young person created it. 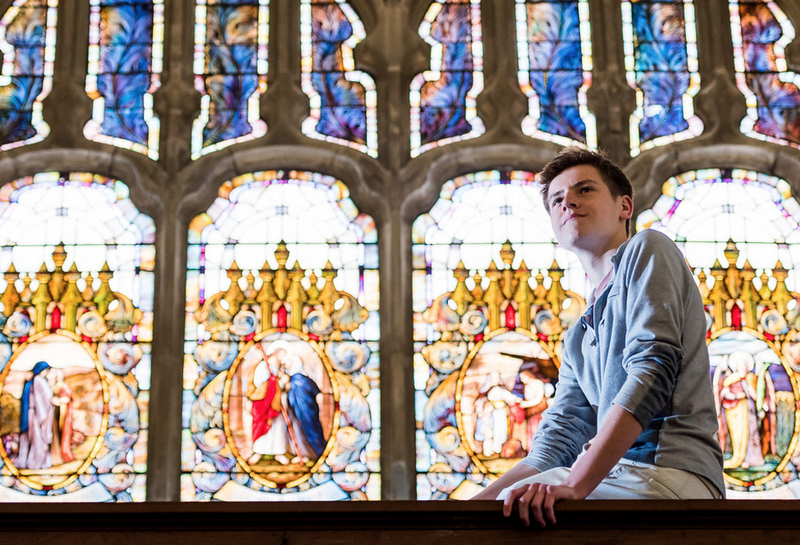 Entirely on his own, asking no one for permission, Herron established a virtual church where young people connect in very real ways. Although many traditional churchgoers might be puzzled by the notion of an online church, Abigail Rusert, an authority on youth ministry, says The Robloxian Christians is worth paying attention to. Are the children and youth in your church agents of ministry, or objects of ministry? What is the difference? Virtual churches are not new or unique. The Methodist Church of Britain created an online church, Church of Fools, for a few months in 2004, which then continued for years as St. Pixels Church. And numerous virtual churches have been created on Second Life, a virtual reality platform. But probably few have been created by teenagers -- or, in Herron’s case, preteens. Herron was 11 when he created TRC, not long after he began playing on Roblox, a popular online video game platform for children and teenagers. Players on Roblox can create their own games and virtual worlds, and participate in other people’s as well. Socializing is a large part of the experience. Players can add people to two lists (Friends and Followers), create or join communities, and communicate by text with others on the site. In 2011, Herron had been using Roblox for about six months when he realized that something was missing. The millions of games on Roblox featured a variety of “spaces,” from role-playing coffee shops to restaurants, castles, combat-type games and more, but he found few connected in any way to Christianity. So Herron created TRC as a community group, and it took off. “It was like a fan club for Jesus that transformed into a church,” he said. Soon, Herron was serving as pastor to a congregation of young people just like him, scattered across every state and inhabited continent. In addition to the group on Roblox, Daniel also created a TRC website and Facebook page. At the time, his parents, Anna and Tim Herron, didn’t know their son was starting an online church, but they weren’t completely surprised when they later learned about it. However virtual TRC might be, it is rooted in Daniel’s real-world faith. Daniel’s family has a long history in pastoral ministry, with several clergy members in the family tree. In 1891, his great-great-great-grandfather, the Rev. Adrian F. Kirkpatrick, founded Tacoma’s Trinity Presbyterian Church, where the Herrons still worship. Daniel and his sister, Katie, are the sixth generation of the family to worship there. His parents met in college through InterVarsity Christian Fellowship and spent several summers volunteering in urban ministry before settling in a low-income urban neighborhood in Tacoma. Two decades later, Anna is a teacher at a local school, while Tim runs Degrees of Change, a nonprofit that helps underrepresented students across the Pacific Northwest succeed in college and then return home to become leaders in their communities. When Anna and Tim first heard about TRC, they assumed that Daniel had created some kind of “game” church. But they later realized it was much more than a game. Anna first took it seriously about two years ago. What makes a church “real”? What are the essentials of church? Tim had a similar experience when he realized that “this was not a kid playing make-believe church.” One day, when Daniel was at his computer, Tim saw on the computer screen five or six avatars, or virtual characters, sitting around a conference table and asked Daniel what he was working on. Today, Daniel has a team of about 15 young people who work in groups -- via email, text and in-game chat -- to oversee various ministries such as worship, prayer partnerships and outreach, much like the organizational structure behind a physical church. More than 140 volunteers work in teams, carrying out the ministries. The church is intentionally nondenominational, a place of worship open to everyone, Daniel said. He considers it “a big mixing pot” that draws from his and other members’ denominational traditions. How do “bricks and mortar” church experiences inform the practices of The Robloxian Christians? Worship is held on Sundays at 5 p.m. Eastern time, an hour when most traditional churches aren’t in session, which allows both “real-world” churchgoers and nonchurchgoers to attend. The church also offers open prayer times, additional morning and evening services, and occasional classes. To attend, worshippers have to register on the site and create avatars to represent themselves. The blocky, fixed-faced avatars resemble Lego minifigures or characters in the popular video game Minecraft (although Roblox has no connection to either). To move around the Roblox world, players use a mouse or keyboard taps. TRC’s main sanctuary looks like a traditional church building, topped by a spire and set in a peaceful and green parklike area. 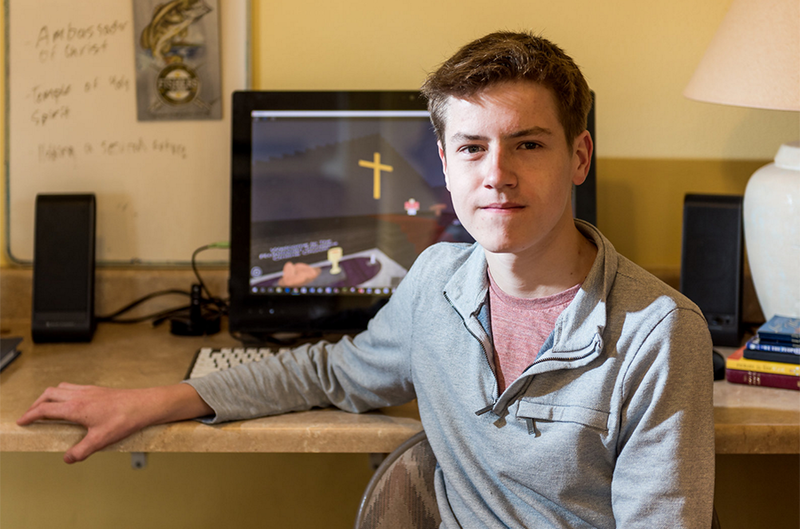 Daniel originally created the elaborate, even beautiful, virtual world by himself, using building tools provided by Roblox. Today, however, TRC’s environment and operations are supported by several tech-smart staff people whom Daniel has “hired,” including A.J. Steinhauser, 17, of Atlanta. Steinhauser was using Roblox to learn and practice coding when he came across TRC. “I saw they were pretty low-tech, so I offered my services,” said Steinhauser, who attends an evangelical church with his family. After he started helping at TRC, Steinhauser became an “associate pastor” and began working on more than computer issues. After entering the church, worshippers can sit in a pew, stand in the red-carpeted aisle, walk around or even jump up and down. They can also visit the front of the sanctuary, where a table is laid with bread and wine. But they cannot climb the three steps that lead to the chancel, where the pulpit is located. Only Daniel and his staff members can enter that space; others are blocked. “We built an invisible wall there to keep the trolls out,” Daniel said, referring to mischievous players who sometimes attend specifically to disrupt the service. Daniel and his staff members can also mute people who are disruptive, but he’s reluctant to use that option. In the Roblox world, “talking” means typing. When an avatar speaks, a text bubble appears over the character’s head. During a typical TRC service, Daniel or an associate pastor delivers a short sermon while congregation members pray or “shout” amen. With some worshippers running around the room or jumping up and down, it’s a lively service, sort of a massive group-texting conversation that can include up to 100 participants -- the maximum capacity for each service. With its emphasis on texting, Roblox is clearly speaking the language of young people. A 2015 Pew Research study found that 88 percent of teens have access to a cellphone or smartphone, and 90 percent of those teens use texting. Overall, the average teen sends and receives 30 texts a day. Pastor Daniel preaches in a sermon of text bubbles during a recent worship service. For teenagers, Zirschky said, texting and other social media are a means of “phatic communion,” a level of communication identified by anthropologist Bronislaw Malinowski in the 1920s that depends little on intellectual content. Even a brief, seemingly meaningless “phatic” exchange -- a smiling emoji, for example -- can have a profound effect by recognizing another’s presence and creating communion. Jaden Bullard, 16, of Olympia, Washington, first learned about TRC through a banner ad Daniel had bought on the Roblox website. Curious, Bullard clicked on the link and was inspired by what he saw. “I was kind of blown away that there could be an actual church on a child’s game site,” he said. It felt like an authentic worship experience. What spiritual and faith formation needs of young people is TRC meeting that “real world” churches are not? Although some adults might question whether TRC is truly a church, that’s not really the appropriate response, said Rod Nash, the director of outreach at Trinity Presbyterian, the Herrons’ congregation in Tacoma. However implausible it might seem to older outsiders, TRC is a faith community where young people are being shepherded and are connecting and finding God in their midst, Nash said. Being on the internet, TRC is accessible to anyone with a computer or smartphone. As a result, young people whose parents aren’t religious or who are otherwise unable to attend real-world church can experience church life. How can your church provide a safe space for unchurched people to ask questions and have dialogue? Even so, isn’t it a problem that an untrained, unordained teenager is serving as pastor and minister to other young people, even if only in the virtual world? Rusert, the director of the Institute for Youth Ministry at Princeton Theological Seminary, isn’t concerned. “They already do this for their friends, in youth groups and in other settings,” she said. “We often treat them as if they don’t have the capacity for spiritual understanding, but young people have been handling difficult things on their own for eons. 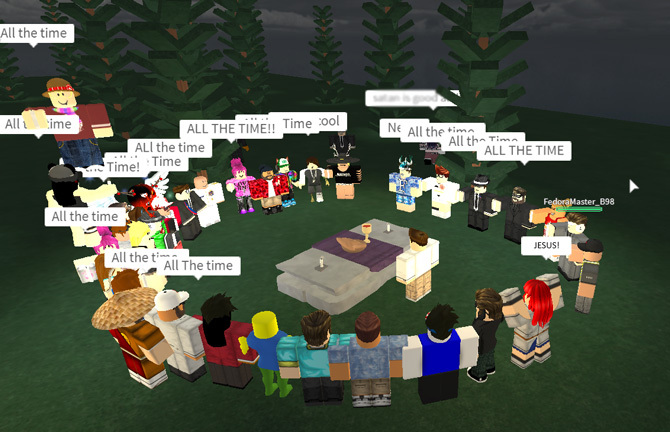 At its core, Roblox has a distinct social component that makes it a perfect vehicle for Christian teens to find and connect with each other, said Zirschky, whose own son is an avid Roblox fan. The real appeal of The Robloxian Christians -- and the broader Roblox platform -- isn’t the technology, Zirschky said. Digital interactivity is not the same as relational interaction, where teens connect with other teens. Being truly present to each other is not the same as having a youth leader or pastor or a sermon theme “connect” with teens. Deep connection and relationship is an issue for congregants of all ages, not just young people, said Julia Corbett, the director of children, youth and family ministry at Trinity Presbyterian, where Daniel attends youth group. “How can we say connection through technology is inauthentic and face-to-face connection is more authentic?” she said. In the “real world,” people tend to maintain a mask over their real personas -- even in church. The lesson of The Robloxian Christians is about the nature of community, Zirschky said. “What teens are looking for is precisely what the church is called on to offer -- a relationality that is far deeper and more personally costly,” he said. In his book, Zirschky contrasts the “face-forward” anonymity of most worship services with koinonia, the scriptural concept and Greek word for community, which can be translated as fellowship, sharing or communion in its most intimate sense. 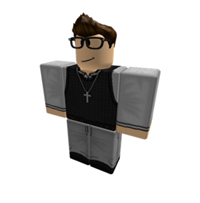 What does The Robloxian Christians tell us about the capacity of young people for imaginative leadership in the church? How do “bricks and mortar” church experiences inform the practices of The Robloxian Christians? Why are “brick and mortar” churches still an important part of Daniel and other members' lives? Is TRC a “real” church? What makes a church “real”? What are the essentials of church?